DropBoks enters the online storage space with a few advantages: it has a simple and intuitive UI and allows users to preview features without signing up. The latter is something that Zoho has done a good job with. Managing files is easy since there's no need to navigate between different pages. One page does it all. All done with the magic of AJAX. 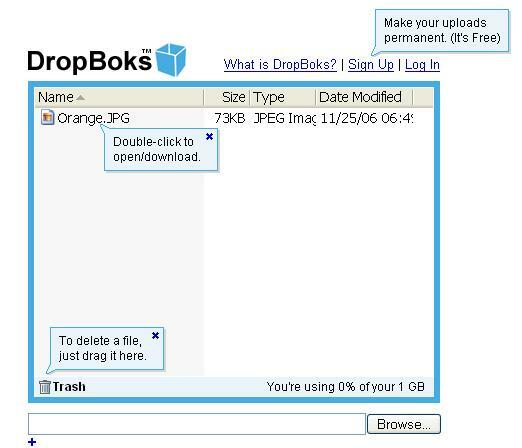 You can upload up to 1GB of files to one account and delete files by dropping them in the trash. The preview mode allows you to play around with managing stored files, but you can only store them permanently with an account.